GWS Server and Application Software outsourced Management offers tremendous opportunities for corporations seeking to improve their bottom line performance. When applied correctly, it reduces costs, increases organizational flexibility, improves business and IT price/performance, and strengthens corporate focus on core competencies. These capabilities generate greater business returns, and provide the adaptability to respond quickly to economic conditions, competitive challenges, and new opportunities. GWS-Group takes responsibility for server and applications maintenance, security and support and (if agreed) of Joomla Site development. Server uptime and Software maintenance and support are necessary overhead to keep the business operational and are ongoing requirements despite economic cycles and changes in corporate strategy. OSAM assist and provides improvements in operational efficiency to reduce costs and free resources for strategy development. 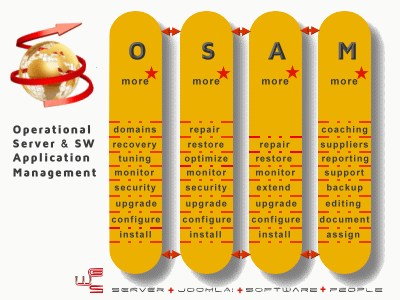 GWS-Group's OSAM advances in networks and communications, well trained sources of educated labor, and a strong focus on corporate bottom lines, is the answer for your system and application, software management. Add effective strategy and governance, best-in-class IT processes, operational business process improvement and support, and you have an opportunity that cannot be ignored – the ability to obtain significant improvements in business performance while simultaneously reducing operating costs. While a quest for cost savings may inspire a company’s initial forays into software development outsourcing, it is the ability to achieve leveraged improvements in business performance that transforms OSAM from a tactical and technical point solution to a long-term business strategy for creating and defending competitive advantage. Pricing of OSAM depends entirely on the needs and/or system environment of the client and we can only provide you with a quote after initial survey. Use the Contact Sales button on the right hand of your screen to get in touch!